Time past is a body of work that uses aesthetics and nostalgia to evoke a context. 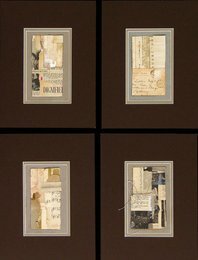 Old, age affected photos, notes, personal letters, music paper and stitching intertwine themselves evoking an essence of times past. Use of splinters of photographs gives a ‘personal snapshot’ association with our emotive, subconscious interest in our beginnings. Hence engaging the audience by the stimulation of personal memories by the sensation of shared experiences. The grid style layout is inspired by the modernist art movements that opened the century and compliment each piece, encouraging the detail of each to be viewed in their own right. As much as this work is about memories and the past, it is also a representation of the postmodern world we inhabit. Materials disused and forgotten suddenly are recontextualised and represented to evoke and engage a new audience on another plane.